On our way south, we’d only stopped in Morro Bay for a few hours. We needed fuel and, with the help of a friendly harbor patrol member, drove up to the propane station before taking off for a quick run around Point Conception. Even in the short time we spent there, we were charmed by the hospitable town so we were very much looking forward to a longer stay there on our way back. Our first evening in town, we spent a few minutes finding a safe place for LiLo. Morro Bay doesn’t have very much transient moorage and all the public docks have a 3-hour limit. We pulled into one of the public docks anyway and walked down to the Morro Bay Yacht Club to see if they had space on their small dock. They didn’t, but we met some other visiting sailors at the yacht club building and they let us into the club where we found instructions about picking up a guest mooring for the night. We walked back to the public dock and motored over to the mooring, then rowed across the narrow channel to the club’s dinghy dock. We didn’t get very far on our walk toward town before the lure of a nearby Thai restaurant pulled us in. We ended up at a table adjacent to the other sailors and exchanged a few pleasantries and travel details before our food came and our mouths were occupied with more important things. The next day, we spent a slow morning getting caught up on sleep and small chores after our days at sea. One of the boats at the dock took off so we popped over and grabbed their spot. Bryan and I packed up our computers and walked up to a cafe for a little while. He left me to do some writing and went back to the boat to crack the whip on the girls for a little cleaning up. When he came back to get me, he looked a little worried. “I think I just lost a filling while I was eating my granola bar,” he said. Of course, most of the dentists in town were already closed for the weekend. We spent quite a bit of time and all my cell-phone battery trying to make an appointment for early in the week. None of the dentists would guarantee and one-stop fix, though; they all wanted to have Bryan come in for an assessment and some x-rays before scheduling the filling for another time. We talked over the problem from every direction, trying to decide if it would be safe to leave the filling until our time in San Francisco, wondering how long our emergency dental filling material would hold up. One of the dentists had reassured us that, if it wasn't hurting already, it probably wouldn't start over the weekend. We made a tentative appointment for Tuesday in the next town over, hoping we could find transportation when the time came and then set aside the problem, which we couldn't do anything about anyway, and walked back to the boat. While I'd been writing, Bryan had stopped by the yacht club to check in and pay for our moorage. The person he'd talked to there invited us to come back to the club in the evening, when they would be having a small get-together with other club members. So we did. We met several really nice people and Bryan had a really good beer. James, one of our new friends, invited us to come crew for him during Sunday's big-boat race. Apparently, dinghy racing happens on Saturday and the big boats go out for an ocean race on Sundays here. I wondered if the race would be called off with all the winds and high seas that were predicted. Both Bryan and Meira came back with wet feet from working the side decks with the toe rails submerged. They also brought back rosy cheeks, cold hands, and enormous grins. 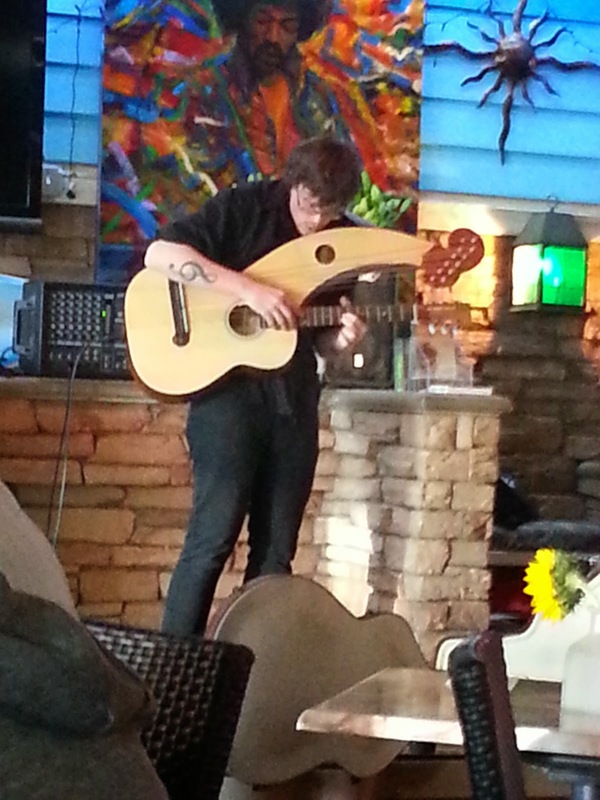 That night, after they helped get all the race boats back to the dock in the strong winds, we headed up to a local cafe to hear Adrian Bellue, a harp guitarist from the area. Chilled from the day at sea (and the day on the boat with no heat! ), we settled in for a warm evening of hot chocolate and good music. Monday, we started getting the boat ready to go back to sea. It doesn’t take long to get lazy about putting things away. Thankfully, it doesn’t take too long to put things reasonably to rights again. In the evening, our new friend picked us up and drove us out of town a ways to her family’s house. Her parents and sister welcomed us so graciously. They probably had no idea how grateful we were for every detail of the night. Their house was lovely and spacious, with wonderful views down into green valley. I stood at the back window and breathed in the peace. Their menu choices included fresh cheese, good meat, and lots of fresh vegetables—all of which are difficult in our small, refrigerator-less galley. And for dessert, they brought out ice cream! We made our own sundaes and stood around the kitchen chatting. Anna’s dad administered a mini-dental exam right there in the kitchen. Sure enough, Bryan had just lost a small chip from one of his back molars. It might need to be polished a little, but we don’t need to worry about it until we get home. Soon the conversation turned to music and before I knew it, I was playing their piano, Anna and her sister improvising along on their violins. Meira pulled out her recorder and an accordion appeared from somewhere. Good food, good company, good music—the night was a feast all around. Tuesday, we met James on the dock again. He is a part-time delivery skipper and was getting a boat ready to go. He generously loaned us his truck and we ran up the hill for gas and groceries. Wednesday morning, we pulled away from the dock, so grateful for our extended time in Morro Bay. The motor up to San Francisco Bay was relatively uneventful. It was a bit rough at times, and the engine seemed to have developed an unnerving cough. But the weather smoothed out enough for us to pull in under the bridge just before the ebb tide turned against us. We were glad to have the AIS on in the morning fog, but by the time we anchored in familiar Aquatic Park, the fog had lifted and the city beckoned.